The Over The Pond to Poughkeepsie Ensemble presented CHARLIE’S BIRDS on Sunday, June 20, at 3 p.m., at Maple Grove Historic Site in Poughkeepsie. CHARLIE’S BIRDS was back by popular demand from the 2009 season. The most recent cast included Linda Roper, Zsuzsa Manna and Michael Frohnhoefer, under the direction of Bill Peckham. Eugene O’Neill’s MOON FOR THE MISBEGOTTEN was originally presented on Sunday, September 20, 2009	at 4 p.m., at Maple Grove Historic Site in Poughkeepsie. The event marked the fifth in a series of performances by the Hudson Valley-based professional theatrical company, Over The Pond to Poughkeepsie Ensemble, which was formed to benefit the restoration of Maple Grove, an historic 19th-century home on Poughkeepsie’s South Side. Admission is free. 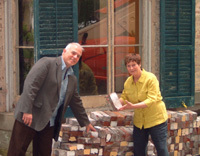 Donations to help restore the site are encouraged. MOON FOR THE MISBEGOTTEN is considered one of O’Neill’s greatest plays. 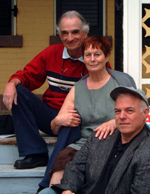 The Over The Pond to Poughkeepsie cast included Roger Hendricks Simon, Linda Roper and Chuck Muckle (right). CHARLIE'S BIRDS written by	Woodstock author, Robert Cessna, was also presented during the first season. THREE FOR A SUNDAY featured scenes from three plays: THE LION IN WINTER by James Goldman, THE MISER by Moliere, and SEA MARKS by Gardner McKay. 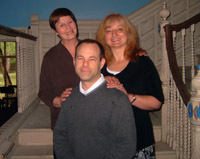 The Over The Pond to Poughkeepsie production included the cast of be Linda Roper and Chuck Muckle, under the direction of June Prager.